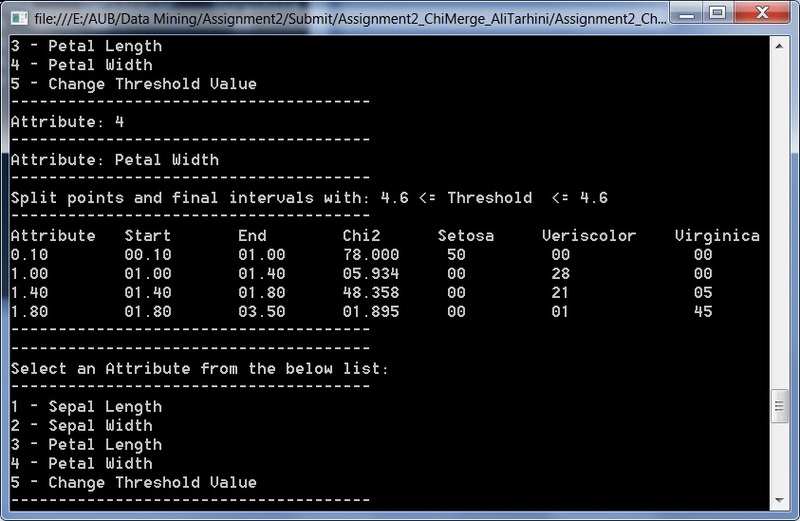 Chi merge is a simple algorithm that uses the chi-square statistic to discretize numeric attributes. It is a supervised, bottom-up data discretization method. It checks each pair of adjacent rows in order to determine if the class frequencies of the two intervals are significantly different. It tests the following hypothesis: that the two adjacent intervals are independent. If the hypothesis is confirmed the intervals are merged into a single interval, if not, they remain separated. In this problem we select one of the following as an attribute: sepal length, sepal width, petal length, and petal width. Three Classes are available which are Iris-setosa, Iris-versicolor, Iris-virginica. The significance level, the higher the significance level, the higher the threshold value and the more likely the adjacent intervals will be merged. Here we have 3 classes thus the number of degrees of freedom is 2. A) Sort the attributes into ascending numerical order. B) Create a frequency table containing one row for each distinct attribute value and one column for each class. Enter the number of occurrences of each distinct value of the attribute for each possible class in the cells of the table. Then generate a set of distinct intervals. Set the interval lower bound equal to the attribute value (inclusive) that belongs to this interval, and set its upper bound to the attribute value (exclusive) belonging to the next interval. C) If the number of rows = minintervals then stop otherwise go to next step. D) For each pair of adjacent rows in the frequency table calculate e the expected frequency value for that combination from the product of row and column sums divided by the total number of occurrences in the two rows combined. The expected value is the frequency value that would be expected to occur by chance given the assumption of independence. Calculate the value of (O – E) 2/E (if E<0.5, replace E by 0.5) where O is the observed frequency value for that combination, then add the values obtained to give chi 2 for that pair of adjacent rows. No chi2 is calculated for the final interval because there is not one below it. 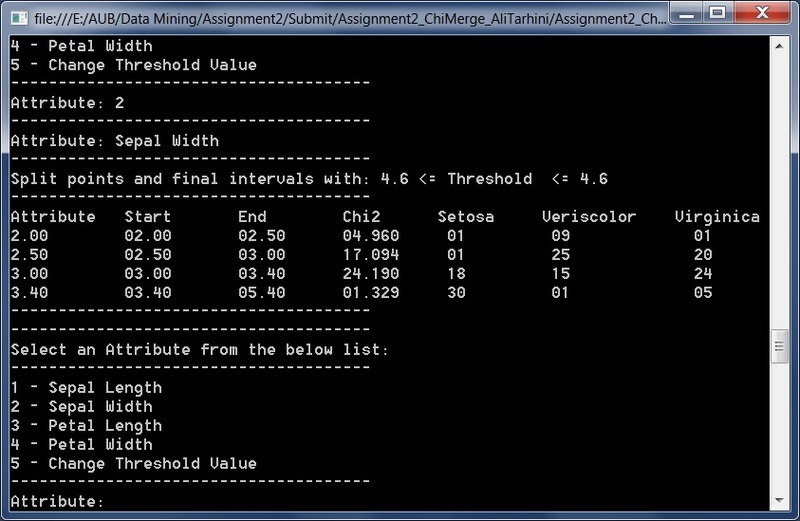 E) Chi merge selects the smallest value of chi 2.This value is compared with a threshold, the two intervals are merged based on the following condition if chi2 is less than threshold or if the number of rows > maxintervals, if the condition is met then the two intervals are merged and the attribute for the merged row to that of the first of the two consistent rows and the upper interval bound to the upper bound interval of the next attribute. Then go to step C, but if the condition is not met then the algorithm stops. 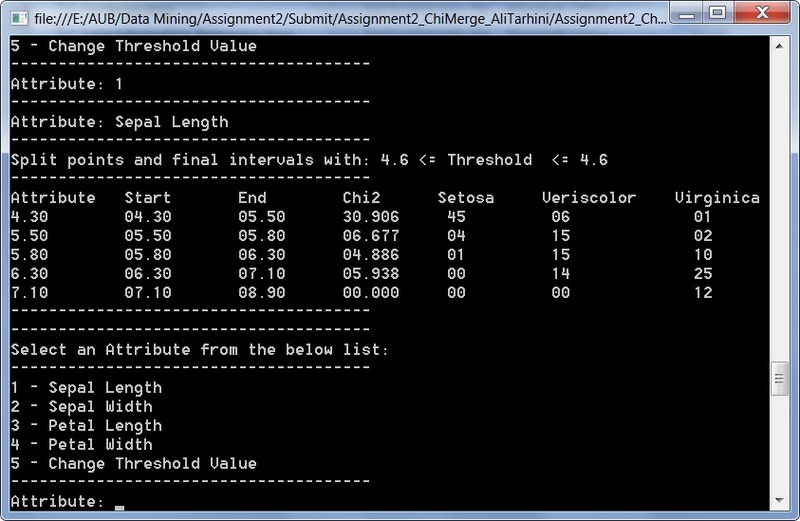 The chi2 values are calculated for the revised frequency table, chi merge proceeds iteratively in this way merging two intervals at each stage until the chi2 for the remaining pairs of intervals are greater than the threshold value and the number of intervals is less than the maximum number of intervals, hence no further merging of intervals is possible and the discretisation is complete. Check these ChiMerge powerpoint slides that visualizes the above algorithm. 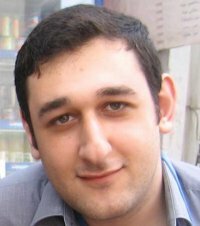 Now lets take the IRIS data set, obtained from http://www.ics.uci.edu/~mlearn/MLRepository.html (UC-Irvine Machine Learning Data Repository), as a data set to be discretized. We will perform data discretization for each of the four numerical attributes using the Chi-Merge method having the stopping criteria be: max-interval = 6. These attributes refer to Sepal Length, Sepal Width, Petal Length,Petal Width & Class respectively. Lets create two classes that i’ll call “IRISDataItem” and “IRISWorkItem”. 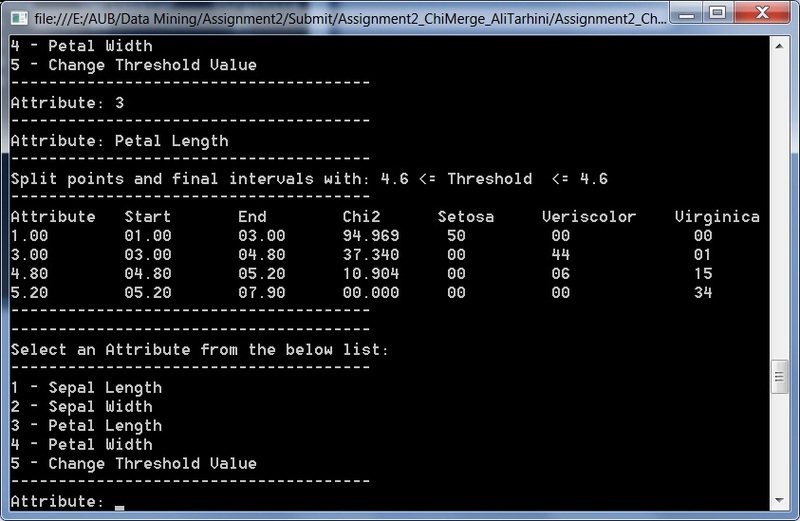 The former will be used to store the attribute values for each when the data file is read while the latter will be used for later processing and storing the ChiSquare for each distinct attribute. Finally, we are ready to implement the Chi-Merge algorithm. One thing to note about the below implementation is the use of LINQ to Objects and Lambda Expressions to filter out tuples that need to be dropped and merged. So you could probably that the code below will compile only using Visual Studio 2010 and .Net Framework 4.0. I haven’t tested it on Visual Studio 2008 Sp1 but if you do let me know if it compiles well.